Commuters spend more than a tenth of disposable income on annual rail season tickets, a BBC investigation found. Figures also show some commuters pay almost 40p per mile of railway while others pay 11p per mile. Campaigners for better railways said people were “astonished” so much of their income was going on travel. Train operators say rail travel is better value for money than running a car. The government said it had capped rail fares in line with inflation. The figures are based on a Campaign for Better Transport list of the most commonly used commuter services in six major cities. Our analysis was based on full time workers using an annual season ticket five days a week. It showed commuters using annual passes into London, Birmingham, Leeds, Liverpool, Manchester and Bristol pay on average, 11% of the net median salaries for those cities. Passengers travelling between Harlow Town and London Liverpool Street pay the most per mile for their commute. A season ticket costs £3,432 a year, which works out at 38p per mile when used for a round trip five days a week, excluding weekends, bank holidays and 25 days’ annual leave. A £1,324 season ticket from rail stations in Worcester into Birmingham, which will rise to about £1,349, covers a 53.9 miles per day round trip and works out at 11p per mile travelled. In London, passengers travelling from St Albans City to St Pancras International would pay £3,383 for an annual ticket once the increase takes effect. This is equivalent to 37p for every mile. People buying a ticket from Portsmouth that is valid to national rail stations across the capital would pay £5,050, equivalent to 13p per mile. Passengers travelling from Brighton to London on Southern rail services, which have been heavily criticised by passengers because of strikes and cancellations, will pay 13% of the average take home pay for an annual pass, costing £4,452. A season ticket from Reigate, also valid on Southern services, costs £2,700, equivalent to 8% of the median full time wage for the capital. As well as the cost of commuting, rail users on Southern services have had to contend with strikes in a long-running dispute between the RMT union and rail company Govia Thameslink. Temporary timetables were also brought in resulting in replacement bus services. Matt Steel, who used to commute from Horsham to London, left his job to find another closer to home because of his commute. James MacColl, head of campaigns at the Campaign for Better Transport, said: “Fares are so high for some routes that season tickets now make up a big proportion of household expenditure for many commuters. “With passengers on some of the most expensive routes also experiencing worsening overcrowding, delays and cancellations, they are often left astonished that they’re being charged even more for the privilege every year. “Short term, passengers must be assured they’ll get proper compensation for disruptions, and fair ticketing must be introduced nationwide, including the long-promised and long-overdue part-time season tickets. 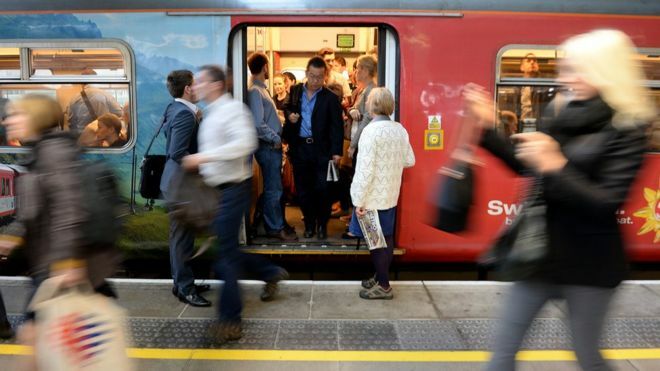 It comes as commuters prepare for an expected 1.9% rise in the cost of rail season tickets in January, in line with the Retail Prices Index (RPI) of inflation. The Department for Transport said more flexible tickets for part-time workers would be introduced. Rail Minister Paul Maynard said: “Wages are growing faster than train ticket prices thanks to action by the Government and our commitment to cap regulated rail fares in line with inflation will save annual season ticket holders £425 on average in the five years to 2020. “Passengers want better services that get them where they need to go. We are investing record amounts in our railways delivering the biggest rail modernisation programme for over a century, providing more seats, more services and better facilities on the trains. A spokesman for the Rail Delivery Group, which represents train operators, said train travel was “extremely good value compared, for example, with buying, insuring and filling up a car”. He said: “Part-time season tickets are something that, with the government, we’re looking at. The way people work is changing and we understand that. Some train companies already offer deals that are suitable for part-time workers.